Ageism, misogyny, and jokes aside, that is pretty much the theme of Chuck Palahniuk’s new novel Damned. Madison is a privileged, fat 13-year-old who is intelligent enough to acknowledge these flaws. What she doesn’t know is exactly how or why she wound up in Hell. And no, she refuses to accept your pity. She finds friends among other eternal teenagers, and together the archetypes begin a journey across hell to find answers, encountering both legendary demons and disgusting scenery along the way. The Breakfast Club’s Inferno. 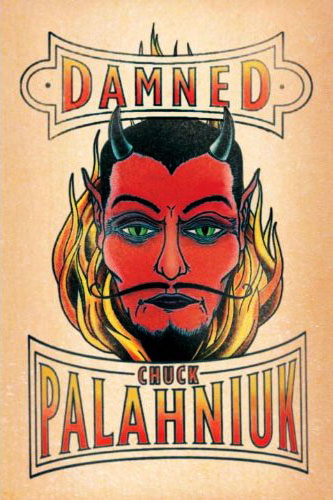 More darkly comedic than terrifying, Palahniuk’s version of hell presents some interesting social commentary on the different ways one can deserve eternal punishment as well as some interesting punishments for those of us whom fire and brimstone don’t scare. Theology, mythology, and pop culture all play roles. His teenagers are not Judy Blume’s, but they exhibit the recklessness and vulnerability that make them feel real despite their grotesque surroundings. His signature “choruses” are present throughout the novel. Besides every chapter opening with “Are you there, Satan? It’s me, Madison,” the most significant choruses involve translations of advice her mother has given her and Madison’s nicknames for all the people her celebrity parents don’t want her to grow up to be. The book sneakily presents some classic theological questions without having the hubris to try and answer them. The occasional advice that pops up isn’t exactly a cautionary tale so much as the kind of common sense most people would benefit being reminded. Explicit material aside, it’s a pleasant read that I polished off in less than a weekend. Chuck spares his readers puns on “damn” and “hell,” so I’ll do the same. Corny writing like that is probably one of the cardinal offenses that gets you there. Damned will be released on October 18th, 2011.